Let's analyze the Final 8. Welcome back to Corner Stats! This article is dedicated to the Final 8 of Serie A, in which Meo Sacchetti’s Vanoli Cremona had won. The Italian Cup reserves every year many surprises and plot-twists impossible to predict. That’s why the format is widely liked. The statistics that are averaged in these few games obviously cannot be used to find some trends, but rather to better understand how the games were played. For this analysis let’s focus on the final. 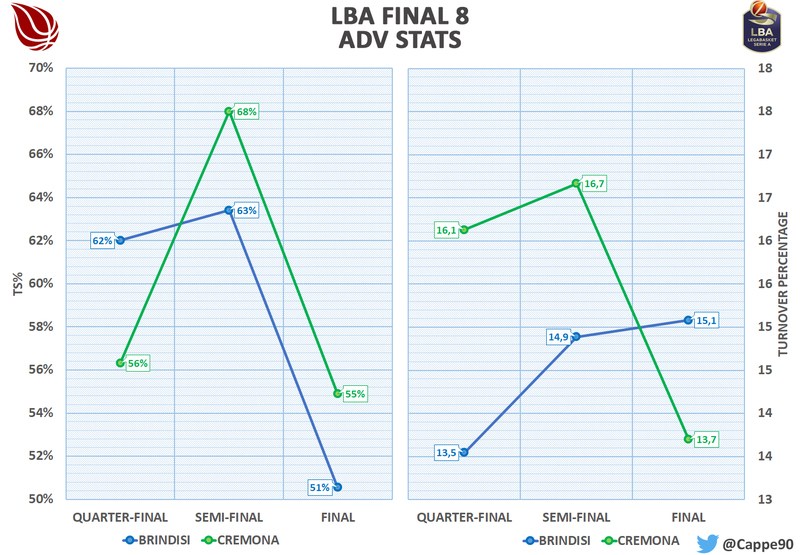 Both Cremona and Brindisi had their worst ballistic performance during the final, surely conditioned by the already mentioned factors of fatigue and tension, but also by more prepared defenses. However, if Brindisi has also worsened its TO%, Cremona was capable to not waste too many of its possessions: this was definitely a key for the victory of Meo’s team. When there are so many missed shots, the team who controls the rebound has a higher chance to win: Cremona has captured the 34% of offensive rebounds, providing themselves a good number of second attempts. Brindisi, in general, has struggled under the rim (48% of grabbed rebounds). In this kind of finals, every possession can be decisive; so the rebounds become very important and, generally, the team who prevails in this battle, wins the game. I did not count Gazzotti for Cremona (who has only played 1 minute in the whole competition). As you can see, despite having one less player, Sacchetti has used more his bench. For example, we can mention Ricci’s performance in the semi-final or Ruzzier’s performance in the final: important contributions that have helped Cremona to raise the trophy. The same can not be said for Brindisi: the only player from the bench who produced points (or at least tangible contributions) was Walker; Rush, Zanelli and Wojciechowski have not been able to give enough quality. This fact occurred in a particular way during the final; to show this fact, I calculated the average efficiency of starting fives and players from the bench. 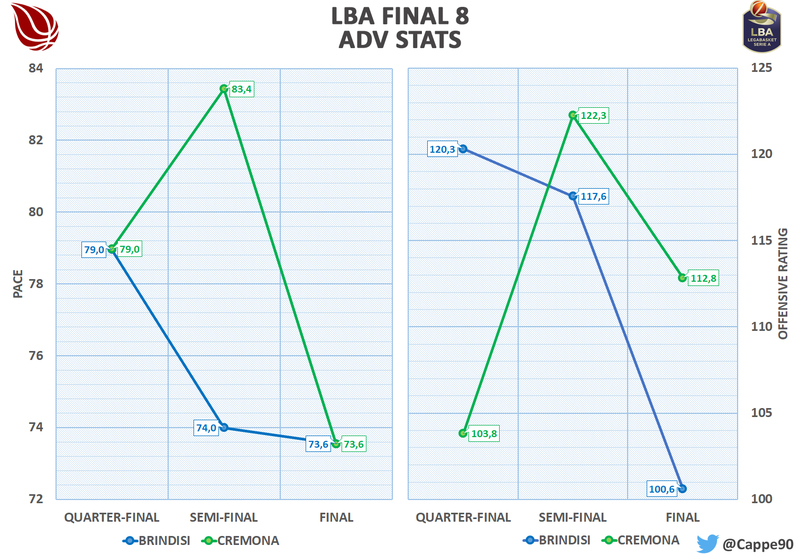 As we can see, the bench players’Offensive Rating was about 109 for Cremona, while it was much lower for Brindisi. In games like this, it is clear that the team that gets the best contribution also from its “supporting cast” has more chances to win. So it was for Cremona, which found important points from Ruzzier and Ricci even in crucial moments. Moreover, you can also see how Brindisi’s starting five has not managed to replicate the high-quality contributions shown in previous matches; surely the fatigue factor played a fundamental role in this drop. Chappell and Moraschini have shot respectively 1/7 and 2/8 from the field (they played very well the previous two matches): Brindisi is a team that takes most of the advantage from the starting five and when even just 2/5 of this group loses efficiency, the whole team is affected. In conclusion, these Final 8 were really exciting: we were able to watch beautiful games with crazy finals. The Net Rating of each team are close to zero (only Cremona has a positive Net Rtg, +12): this value confirms how all the games have been decided in the final moments. Vanoli was the team that showed the right mix of talent and experience to win (and its Net Rating confirms it): a well-deserved trophy for it.